Adirangga, Marlon (2005) Hubungan kohesi dan peringkat tim bola basket yang mengikuti kompetensi IBL (Indonesia Basketball League). Skripsi thesis, universitas Tarumanagara. 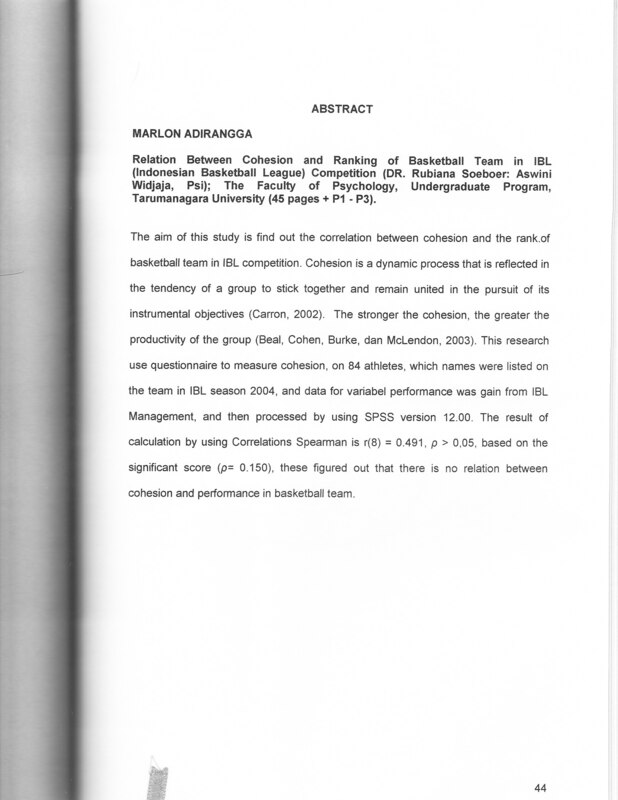 The aim of this study is find out the correlation between cohesion and the rank.of basketball team in IBL competition. Cohesion is a dynamic process that is reflected in the tendency of a group to stick together and remain united in the pursuit of its instrumental objectives (Carron, 2002). The stronger the cohesion, the greater the productivity of the group (Beal, Cohen, Burke, dan McLendon, 2003). This research use questionnaire to measure cohesion, on 84 athletes, which names were listed on the team in IBL season 2004, and data for variabel performance was gain from IBL Management, and then processed by using SPSS version 12.00. The result of calculation by using Correlations Spearman is r(8) = 0.491, p > 0,05, based on the significant score (p= 0.150), these ngured out that there is no relation between cohesion and performance in basketball team.